This amazing rolling ball sculpture is designed to entertain and distract children with fun motion from one end of the case to the other. There are three ball lifts for two different sized balls. One of the balls is a water-filled rubber ball that has colored glitter, confetti, or ribbons inside. The unique nature of the water balls makes them appear to roll like no other ball can; almost sliding along the track and not rolling. Yet, the ball can still bounce and jump through the air like other balls. 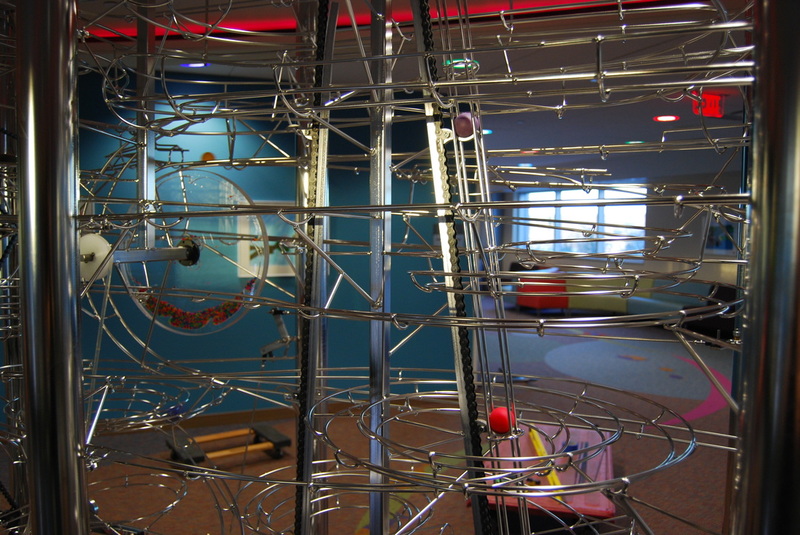 Intertwined with the large ball’s track is a smaller ball track that fills the space up with fun and exciting motion. One track sends the smaller balls into a loop-the loop with multiple inversions at high speeds. Free-standing sculpture 84” tall, 36” deep, and 13’-0” long on a curve with a 33’ radius. The custom display case is enclosed in curved, tempered glass. The display features four hinged access doors and interior lighting. 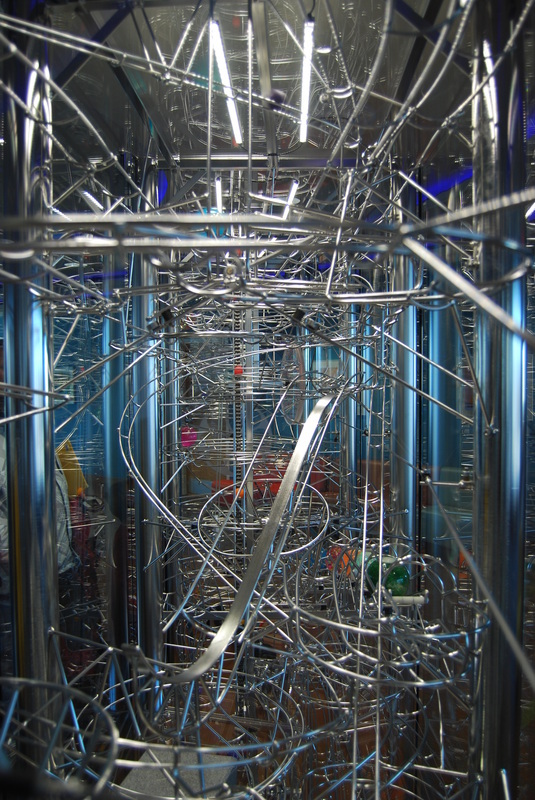 The sculpture has three ball lifts driven by a single motor. Have two separate, but intertwining tracks. One for a 4” diameter water-ball, and one for a 1-3/8” plastic ball. The unique collection system can sort out which ball is which. 6 exciting track elements for the 4” ball. 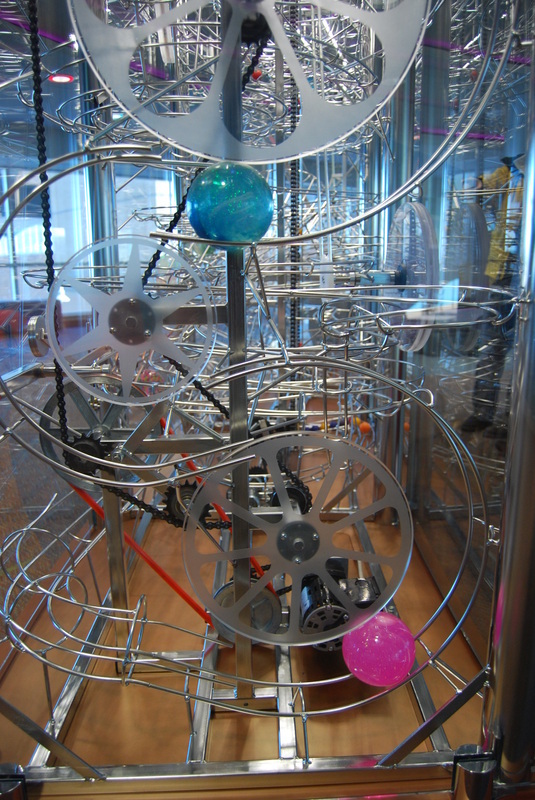 The large-ball track has two lifts, one switch, two paths, and linkage-based mechanical ball-release mechanisms. The sculpture runs continuously during normal business hours. 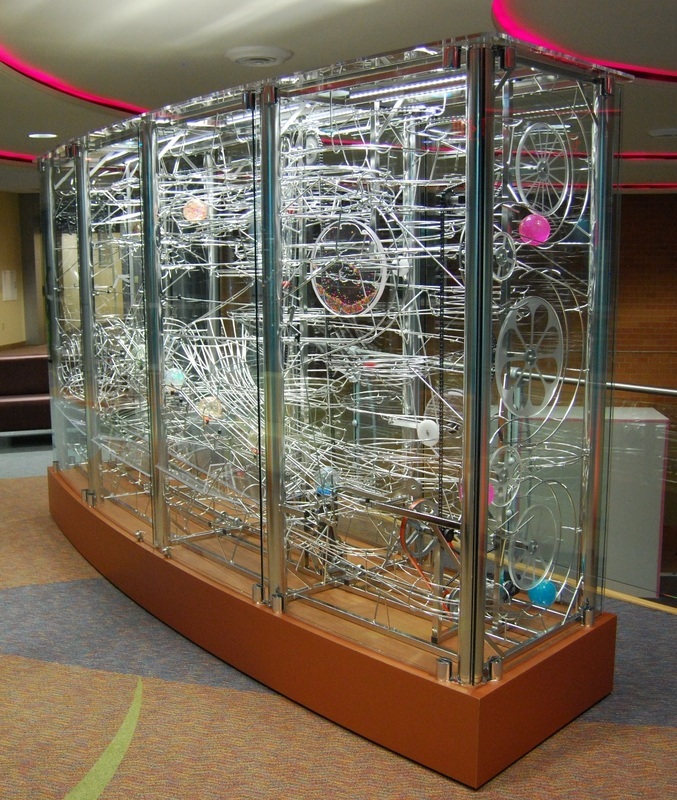 The Water Ball Wonder Rolling Ball Sculpture in Children's Hospital, Omaha features a curved case and exciting interior motion. Water Ball Wonder follows the curves of the building's architecture. The curved display case is designed to flow perfectly with the architecture of the space. To achieve this look, the case features curved tempered glass and a laminated wood pedestal built on a curved steel structure. 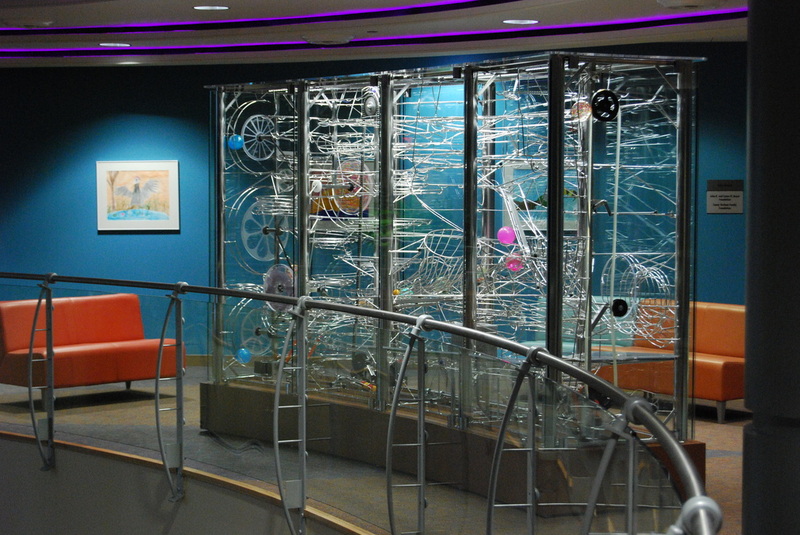 The whole display had to be built in smaller sections and reassembled on-site; the limiting factor being the size of the elevator and door openings. An interior view of the jump ramp for Water Ball Wonder. Water Ball Wonder has two different sized balls. This is a view of the small ball chain lift. The Friction Disk Lift moves two water balls up the curved tracks.